Gold is always a good investment. And while gold prices are more or less the same around the world (it is a global market, and in Cambodia shops adjust the price of gold daily based on the global market), the price of workmanship is not (for the current price of gold, you can see the price chart at the bottom of the page). So while you are not going to get a better deal buying gold bars in Cambodia, you can purchase gold jewelry at a significantly lower mark-up than in Europe or the United States provided the workmanship is local. 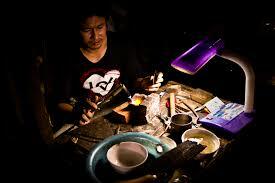 There is a lot of Italian jewelry imported to Cambodia, and it will have a premium price attached to it. But you can expect a markup of only about $20 over the spot price for most locally smithed gold. Being as this is less that the above-spot price charged by gold brokers for bullion in the United States and Europe and well below the mark-up for gold jewelry, it means that gold is Cambodia is quite a good deal and one you are not likely to find in the West or India. You might be surprised to know that finding 24 carat gold is pretty easy to find, and for an investment it is your best bet. It is known as ទឹកដបមាស, "Tuk Dap Meas" (មាស "meas" means gold in Khmer; ទឹក "tuk" or "water," and ដប "dap" means "ten"--and it just means the gold tests pure and is and is pure gold--99.8% gold, at least). 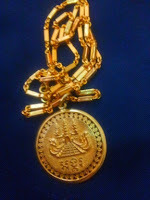 You will not find gold of this sort commonly in Thailand--only Cambodia and Vietnam generally sells pure gold like this. Pure gold will have a gaudy yellow look to it, and it is soft--you should be able to make a dent in it with your thumbnail. Most jewelry sold in the United States is at most 22 carat (91.6% gold) because of just that reason--pure gold is soft, and if constantly worn it actually wears down. And since most people do not want their gold disappearing, most opt for less than pure gold. You can also find more wearable jewelry, but the prices can be harder to pin down as well as determining just what percentage of gold you are getting. It is fairly easy for a novice to tell pure gold from 18 carat gold, but a lot harder to tell 22 carat from 18 carat and you probably aren't packing a gold tester with you in your suitcase. Also, the Khmer do not use the carat system you might be familiar with. Instead, gold is measured in parts of a thousand. Khmer by far prefer pure gold. As gold is viewed as a way of preserving wealth, they want it to be of the highest quality and most easily disposed of if needed. Most Khmer prefer gold to banks, and who can blame then when many lived through a time when money was actually abolished in their country--so any wealth in banks or cash disappeared overnight. Nearly all markets will have gold dealers tucked away. of the well-to-do sporting gold jewelry. Overwhelmingly, gold dealers in Cambodia are honest and will provide a certificate of purchase (in Khmer) that states what it is you bought and how much you paid for it. These little slips are important if you think you might be selling or pawning what you bought in Cambodia. If they do not give you one, request one. They should indicate the price per chi (we'll get to that below) as well as the total amount paid. They will also have modern scales and they should show you the weight on the scales of anything you decide to purchase. If you suspect you may have been ripped off, you can sell it back at a small loss as long as you have the receipt (usually no more than $5 unless somehow the price of gold plummets from the time you buy it and decide to return it). It is better to be safe than sorry, and if you don't know what you are doing or what you are buying, you probably shouldn't be buying. You may be able to negotiate a few dollars off the price, but don't expect the price to come down dramatically. As stated earlier, gold prices are fixed according the global market. That being said, you should know the price of gold before you go to buy and also understand how gold is measured and sold in Cambodia. Gold is sold by the chi (ជី) in Cambodia (and Vietnam). Ten chi equals one damlung (តម្លឹង). A damlung is 37.49 grams, meaning one chi is 3.749 grams. At today's prices that means one chi is selling for $149.96 USD. Of course, by tomorrow that could have changed. * We find it a bit annoying that many sites list one chi as 3.8 grams. If you use that figure, you are going to figuring one damlung as 38 grams, not 37.49, and so would be paying $70 extra per damlung in today's market for their mistake. Before you head out to purchase gold, it is a good idea to check the current gold prices (below) and covert it from grams to chi. Then, considering that there will be a $20-$30 charge above the spot price, that will give you an idea of what is a good price. So if you have $400 to spend, you can buy just a little more than two chi of gold or about ten grams. That is really a great deal considering that buying bullion in the states generally has a markup for $60 or more above spot for one ounce, and if you have to pay for shipping watch out as that will be an added cost (plus insurance). One thing that the comments on this article have reminded us of is that the price of gold shoots up around the Lunar New Year, and generally has a substantial dip in price right afterwards. During these times of very high (and very low) local demand, the spot prices on the ground may be somewhat higher or lower than the global price (just like around the Lunar New Year in China or Diwali in India). Keep in mind that internationally gold is often dealt in troy ounces. One troy ounce equals 31.1 grams (that is 8.23 chi). Also, keep in mind safety. Wearing something like this in public can attract the attention of thieves and pick-pockets. Travelers have had chains ripped off their necks by passing motorcycles or while sitting in a tuk-tuk or even had them cut off their necks without them even realizing it. If you are wearing $500 around your neck it can be a tempting target. And of course never, never put something like this in your checked bags when you fly! If you are buying tuk dap meas it is probably an investment, so make sure you protect it as one. A final reminder . . . remember that you are suppose to declare goods acquired while abroad. The United States, for example, allows you to import $800 of goods into the country without paying customs duties. Also, gold does not count as a monetary instrument in the USA. You should check on the customs for your country as you don't want to get charged a custom duty for that gold you got such a good deal on! *The price of gold declined nearly $50 per chi since this was originally published. The price included here is from March 30, 2017. However, the rest of the article considers used historical prices.